How quickly we forget. When it suits. Last April a small group completed a 155km walk from Strokestown, County Roscommon, to Dublin, in memory of 1,490 people offered assisted passage to Canada by landlord Maj Denis Mahon as he cleared his lands during the Famine. In 1847 they were frogmarched by his bailiffs along the banks of the Royal Canal to Dublin, where they boarded ships for Grosse Ile in Quebec. Among the 1,490 was widow Mary Tighe (whose husband, Bernard, had already died of hunger), her brother and her five children. Such sentiments were not lost on Taoiseach Enda Kenny. Speaking a month later to the crew of LE Eithne as they prepared to leave Cork to help rescue migrants in the Mediterranean, he highlighted Ireland’s historic familiarity with such tragedies. After the second World War, Jewish groups in Dublin had great difficulty in securing refugee status for Jewish children to come to Ireland. In 1948 the Department of Justice offered a ludicrous explanation: “It has always been the policy of the minister for justice to restrict the admission of Jewish aliens, for the reason that any substantial increase in our Jewish population might give rise to an anti-Semitic problem.” Then taoiseach Eamon de Valera overruled the department and 150 Jewish children were brought to Ireland. Few of the 120 or so Chilean refugees who were eventually accepted by Ireland in the 1970s remained. They too experienced great difficulties. 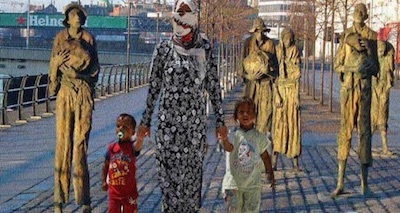 As of February 16th last, there are 7,937 asylum seekers in Ireland, 55 per cent of them for five years or more. They live in inadequate conditions of forced dependency while allowed a weekly pittance and condemned to a limbo of unknown duration.